An evening of wine, food, hospitality and education in honour of the intriguing biodynamic wine, Ceago, was held April 30 at 100 Wines by David Walker and Olives restaurant (conveniently located right next to each another). It was wonderful to meet many of the people involved in the wine making process (from producing wine to selling and enjoying it), especially because we profiled premier California biodynamic wine maker Ceago and 100 Wines by David Walker which carries this brand in Calgary in the Spring 2009 issue of City Style and Living magazine. Katrina Fetzer, whose family owns Ceago, spoke about living amongst lavender fields, olive groves and portable chicken coops at her family's vinegarden. As she spoke about the process of making wine biodynamically, it became apparent how practical and intuitive the process really is. Katrina explained that one of the formulations suggested by Rudolph Steiner calls for ground quartz crystals to be sprayed on the vines so that the sunshine will be reflected and magnified (which is useful on overcast days). She said that when they were first experimenting with the formulation at Ceago, they sprayed too much of the crystals and everything was scorched. Even today, if someone at the winery gets some of the quartz on them during spraying they will get sunburn. Executive chef Jonathan Canning and General Manager Garth Brown of Olives spoke about the social aspect of food and wine. Chef Canning was inspired by Ceago wine and olive oil (available at their winery) for his menu. Olives provided some beautiful appetizers for the evening. From 100 Wines by David Walker we walked across the hallway to Olives. And now onto the menu and pairings for the evening. After the last course was eaten and the chefs and sous chefs came out to loud applause, the lively conversation continued across the dining room. By then, the sun had long since set, and all that remained were Katrina's words, "At Ceago, we want our wines to speak to a sense of place." An event of this nature is what we need in Calgary. I would have attended if I knew about it. Thanks City Style and Living Magazine for telling us about this event. Will you be notifying you subscribers about this event in the future through your newsletter, that you send out? Wow the food looked fantastic and I am sure that the wine must have been exquisite. 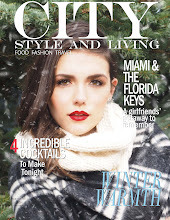 Thanks City Style and Living for highlighting this event in your faboulous magazine. You continue to highlight events not covered anywhere else. Keep up the good work.